Eight ways to shoot for early deer season success. It’s hard to avoid the eyes, ears, and nose of one deer. Your odds for going undetected greatly diminish when two or more deer approach bow range. During the peak of the rut, bucks are hot on the tails of does, and the does are usually the ones that give you away. 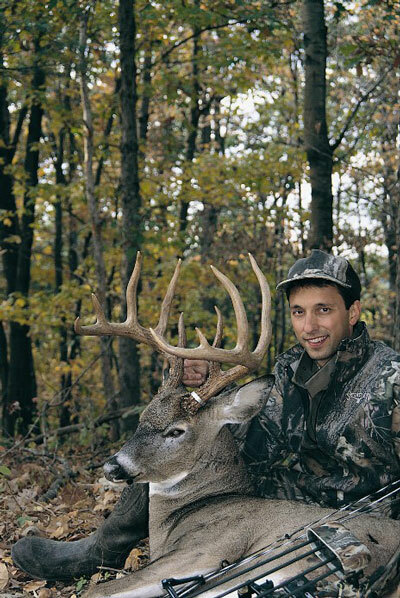 Prior to the rut, mature bucks break out of the bachelor groups they fraternized with during summer and early fall. Trophy bucks, especially, tend to be loners. When you get one in range early in the bow season, there usually won’t be other deer nearby to blow the opportunity. 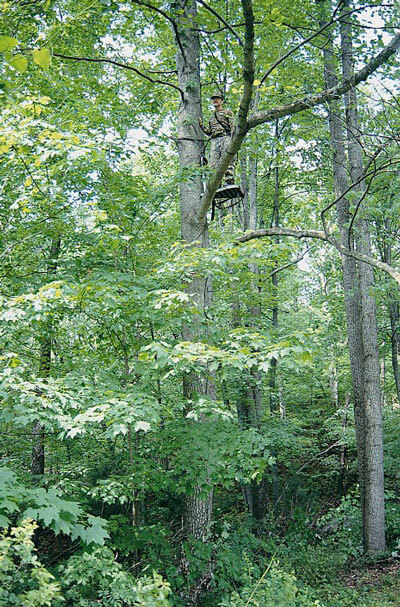 Since trees still shimmer with bright autumn foliage before the rut, hunters can more easily avoid keen eyes and hang stands lower, which is safer and affords a better shooting angle. The foliage also lets you get away with stands in open woods and in isolated trees, places where you would be blatantly obvious when the leaves are absent during the rut. One situation that allows Rex to hang a low stand is where leafy saplings grow around a mature tree. He places his stand in the tree so the saplings top out at his waist level and break up his outline. “During the peak of the rut when saplings are bare, a stand like that would stick out like a light post,” says Rex. Even though bow seasons typically open weeks before the rut, many bowhunters spend little time afield until the rut commences. Earlybird bowhunters get shots at unharried bucks that are more likely to be caught off guard. You also have an opportunity to tag a big buck before somebody else shoots it. By taking vacation time before the rut, you have prime hunting areas pretty much to yourself, especially on weekdays. When you pattern the movements of a good buck, it is less likely another hunter will inadvertently foil your ambush. When rutting bucks chase does, they often move quickly and are hard to stop. This can result in a poor or muffed shooting opportunity. Before the rut, bucks move at a slower pace and are more likely to present a standing shot. When they are moving, they may be easily stopped with a soft grunt. A rutting buck, on the other hand, moves briskly, intent on a destination or smitten by the scent of an estrous doe. It often takes a loud noise to make it halt, and it may not hit the breaks in your shooting lane. Longer days give those who live near whitetail habitat an opportunity to get in a few hours of prime evening hunting after work. This is especially true for those who live in states that switch to daylight savings time late in October. In Ohio, for example, legal evening shooting hours run as late as about 7:40 p.m. during early October. Due to the warm weather, which is typical during the early season, deer tend to move late in the day, often during the last hour before dark. This gives Rex an opportunity to get into his stand late in the afternoon without spooking deer.